Back to the Beginning? This is taking a while. I went to a larger size paper (about A3) and painted the first layer with a big mop brush and it was a lot of wet-in-wet fun. So I decided to carefully add glazes over different parts of the flowers to give them more oomph. Now I need to reclaim some highlights and definition, and also to make the seed pods more architectural and less cartoony. And I'm really not sure about that brigh green. But we're getting there. And then I'll be ready to move on. 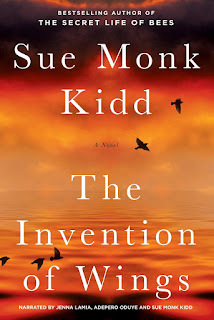 The last of my summer books - well, the weather turned on the 1 of October, but we had a lot of sunshine, so I'm stretching summer for as long as I can. 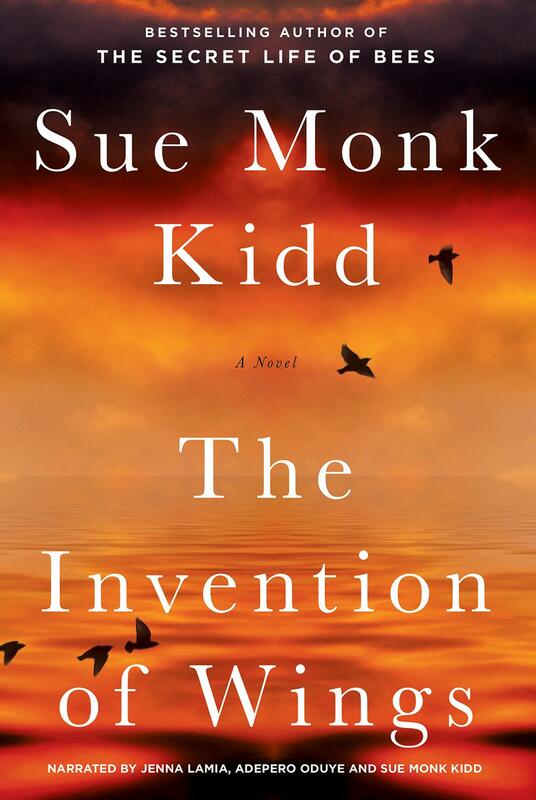 The Invention of Wings is a story about slavery. I thought it was total fiction, but it's not. There is actually quite a bit of historical fact in it. A beautiful story, beautifully told, from the perspective of a young slave, Hetty "Handful"and her young owner, Sarah Grimké. Gripping, gorgeous, heart-breaking, and uplifting. Why is this ink sketch called lost? Tristan und Isolde at the Met HD last week was fantastic (if you ignore that Tristan's physique wasn't the sexiest or that they were wearing drab cold-war-on-the-Russian-side clothes). First of all, it's a beautiful opera, with powerful, melodic music. The singers were top notch: Nina Stemme, Stuart Skelton and René Pape in the main roles. The conductor was Simon Rattle. The production was interesting, with atmospheric radar and sea projections. How can a radar projection be atmospheric? I know, I know. But when it matches the music at the start of the opera, it just carried me into its own world. But it's really all about the music. If you can't bear to listen to 4 hours of Wagner, listen only to the overture, and to the very last piece, the Liebestod. And was I the only one to see the cinematographic references? Definitely Apocalypse Now (the dark, the fans, the ship, the soldiers) and Melancholia (interesting boomerang homage, well at least that's how I interpreted what looked like a planet hurtling dangerously close to the camera, plus the little boy lying on the ground, and the sparks in the air). And probably plenty more that were lost on me. Walking on my own these days. Well, not really on my own. If it wasn't for the big boy, I wouldn't be walking half as much. But with a sick husband, no chat means noticing my environment more acutely. Not sure this counts as poetry? If there is such a thing as impressionistic poetry, then maybe that's what it is. Warning: I'm no good at counting syllables, or rhyming. What is hidden? Who is hidden? My thoughts? My feelings? The real me? Food in my mouth, that's making my face look so jowly? An intense drawing, done live, looking in the mirror. These are always more serious than from a selfie. Well, try smiling for the cameras for 20 minutes, and you'll understand why. I tried to make a sad face for this InkTober prompt. I took a selfie and drew from it. Well the result was nearly a fat face, which I tried to correct with my trusted Montana acrylic marker, but it wasn't opaque enough. Maybe I should add a few dabs of gouache? No matter how they turn out, I always love drawing self portraits. Somehow, I find it a lot less intimidating than drawing somebody else. I don't really care what people think of me, I suppose. I'm skipping the odd day in InkTober, but overall, I'm trying to stick to it - just 10 minutes every day. I am enjoying finding things to draw around me, without having to think too much about it. Mostly I am using a Lamy Safari pen and I use a waterbrush to create the blended greys. I am using the prompts from the InkTober website, but only fairly loosely. Well, in this case, it was appropriate enough for the subject I picked. And in case you're wondering, it's a tiny little plate, with just one wafer biscuit from Marks & Spencers Belgian biscuit set. I was showing true restraint. Normally, I need to eat 3 or 4 at a time, which is isn't bad, considering how delicious they are. And they remind me of my childhood. And it's currently two for the price of one in the shops, so I'm stocking up. I wasn't there. But looking at these videos, I wish I had been. Next Urban Sketchers Symposium is in Chicago. A bit far to go. Last weekend (well, actually the weekend before last), the Dublin Sketchers group met up in Temple Bar, around Meeting Square. It was a beautifully sunny afternoon, and most of us chose to stay and sketch outdoors. Apart from an outburst from a paranoid passerby, we had a lovely time, further enhanced when one of the group grabbed a guitar and surprised everyone with his musical and vocal talent! And we even managed to get a long table in the IFI café to accommodate the growing number of sketchers. I'm interpreting the InkTober prompts fairly loosely. I am a hoarder - not as bad as some other members of my family who shall remain nameless. But I carry the gene, along with the DNA for batwings, bags under the eyes and lines over the upper lip. The weak chin comes from the other side. So rather than draw my shoes, my clothes, my makeup, my art supplies, my old magazines (really? yes, I do keep old Boden catalogues - guilty pleasure! ), I decided to draw a few stones - my collection of stones is not extensive - a dozen or so, mostly from Killiney beach as far as I remember, but they are like gems to me. I should dust them, now that I think of it. Killiney beach on a Sunday morning! Last Sunday was our first time at Killiney beach after the summer. You forget how beautiful it is. And how peaceful. Met a man with an American Pitt Bull - a real pet, despite the fact he wasn't neutered. But strong. I'm not sure if I'm committed to this yet. I would be much happier to have InkTober in February, when life is not quite so busy. But I'll try a few and see where we go. Mugs are my nemesis, so maybe it wasn't a good idea to start the month with one. But there was a downlighter right over it, and the shadows were interesting. Unfortunately, I didn't think of taking a photo, and now I can't remember which shadow was dark and which was light. I can always try it again. Why did I not think of that until now? I was drinking that cup of tea at our dining room table, so I should be able to reproduce the setup, shouldn't I? The prompt for this drawing was "Fast"
It's a couple of weeks since I got a chance to work further on my assignments for this online course. We're now getting into the more technical stuff, and that's slightly intimidating - maybe that's another reason for my procrastination! PS: and in case you're wondering what the little green and turquoise round boxes are, they are pan-pastels! Next assignment is to draw a chair in a public place. Scary stuff!! How long can I put it off?? While I was in Dun Laoghaire, I took the opportunity to do a little watercolour sketch of the harbour. I would have been very happy with it if I hadn't tried to paint a few sailing boats! I would have been better off skipping them altogether. 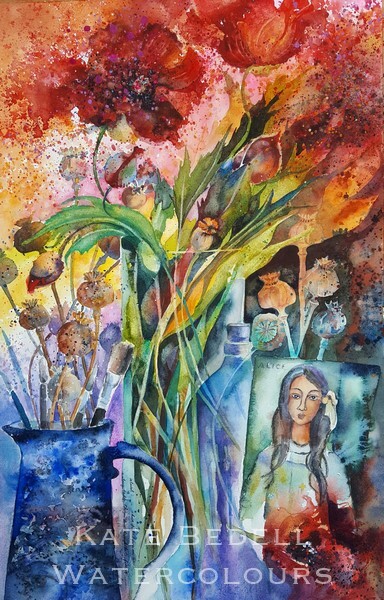 Really inspired by the Watercolour society of Ireland's exhibition in Dun Laoghaire last week. Over two hundred paintings I think. Not all of them to my taste. But some that I fell in love with at first sight! I spent an hour examining them all in great detail! A still life somewhat reminiscent of Shirley Trevena's work, it was my top choice from the show. It represents everything I'd love to be able to do with watercolours - all about rich colours, textures and a dreamy atmosphere. 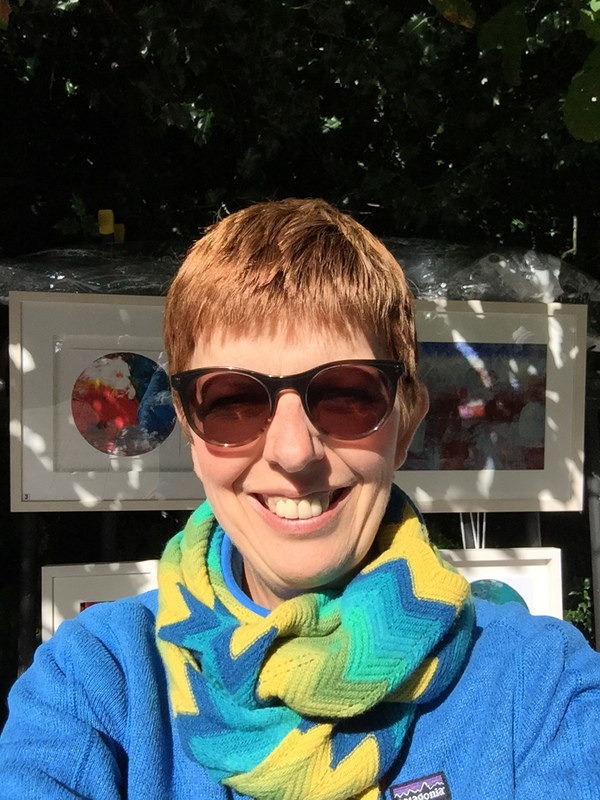 This is the only one of the three I could find on the artist's website. Photography was not allowed at the exhibition. I actually asked at the desk if it was allowed. I could probably have taken pictures with my phone without being noticed (I know some people did), but I felt it was important to respect that request. Colourful Collection by Maureen Phelan A big bold painting - a vase with flowers, all in pinks and yellows and a gorgeous sea green. It needs a big room. But it's such a happy painting. Slea Head Beach by Joe Dunne. This painting looks so simple - beach, sky, sea - but it's so striking. And I know what he achieved is not easy to do - painting convincing waves without using white gouache! My ultimate goal! I wanted to try something a bit different with my poppies, so I took a sheet of cheap watercolour paper and the biggest brush I have in my bag. It ended in a very watery mess. The paper buckled. The paint gathered in the middle. It took a long time to dry. But as always, watercolours dry lighter, a good bit lighter. So it gave me a good background to work from. Somewhere along the way, these poppies lost their poppiness, I think. In my eye, they look more like begonias now. But that's ok. It was just an experiment. But I do like the brighter red. And the splatter. So there will definitely be a third version on the cards, in a larger format this time. (The original and this one are about A4 in size). And here is how it will probably end up - Solomon's judgement - that's it, I've found the title for this painting! Fascinating piece of historical fiction, Mrs Engels. And what better subject than an illiterate woman who was the lover of a very famous man! Lizzie was an Irish mill worker in Manchester. The mill was owned by the Engels family, and Friedrich Engels, the son, was sent to Manchester to learn his family's business. He became interested in the plight of the workers, became the lover of an Irish mill worker, Mary, and after she died, he started a relationship with her sister Lizzie. In this book, we see the world through Lizzie's eyes, the Manchester where she was a young working woman, the London where she mixed with Engels' friend and fellow philosopher Karl Marx and his family. A wonderful story of an outsider, who got herself into the ultimate insider position, and what she thought of it all. Of course, as she couldn't read or write, there are very few records of what she actually thought, but the Lizzie that's been created by Gavin McCrea is a likeable character, warts and all. Back to serious painting now that the summer is officially over. Somehow, I found it hard to complete a full painting during June, July and August, and as the good weather continued into September, I was starting to think I would never be able to paint again. But here we are, now, full of energy and new ideas. I decided to ease myself into the process. Yes, I still want to paint ambitious landscapes, seas and skies, and even roses, but poppies are so cheerful that I felt it was a good subject to start with! I used a photo I took in Airfield in June as my starting point. I was inspired by a poppy painting by one of my favourite artists, Shari Blaukopf, so my watercolour is not very literal, but it's full of life and freshness. And that makes me happy! Here is the sketch I did before touching my good paper! I liked the idea of the blue sky, but it sucked the air out of the painting, I thought, so I opted for a much lighter background. 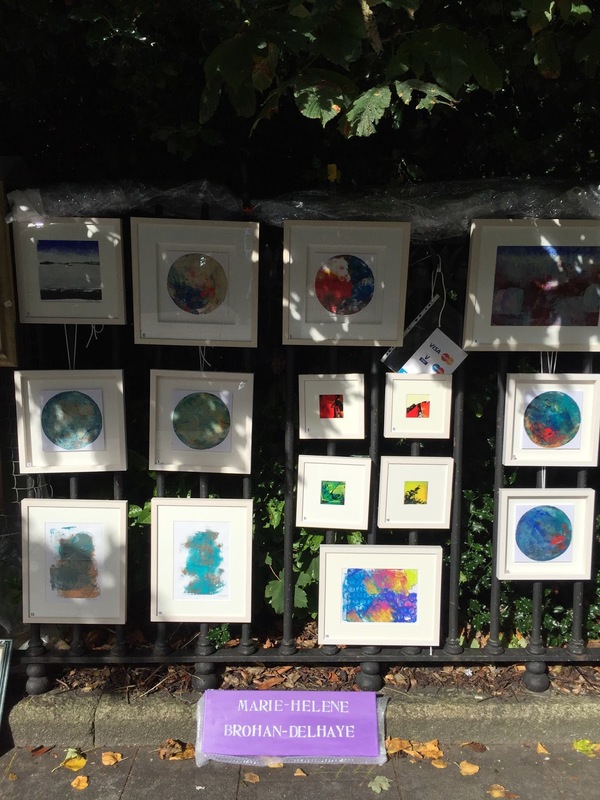 Had a great time at People's Art on St Stephen's Green last weekend. Lovely and sunny on Sunday, and it was such a lovely feeling to sit there and watch people go by, enjoying the art on display. Thank you to all of you who dropped by! Exploring all sorts of techniques. Jack (or Jane) of all trade, master (mistress?) of none. But all that matters is that I am drawing and painting fairly regularly these days, if only for ten minutes here and there. Initially I wasn't very inspired by the RHA as a Dublin Sketchers Location, but once I looked out the window and settled into my work, I really enjoyed the outing. A good spot for a rainy day! OK, I didn't get very far with my Summer painting projects. We're now officially in Autumn (BB has put away his shorts), and I never got beyond this thumbnail. But it's not a bad thumbnail. If only I got started on a painting rather than sketching and doodling. I have allocated three timeslots on my calendar: one for drawing, one for studying Japanese and one for painting. I'm doing quite well on the first two, but the last one is still at the mental block stage. Or maybe I shouldn't be so hard on myself? I have painted tea pots and mugs and barns after all. But you see, in my mind, these are not real paintings. They are practise exercises to develop my observation skills and eye-to-hand coordination. And they will make me a better painter in the long run. Or maybe I need to move my painting timeslot to a different day, or maybe just get up earlier? And paint before I go downstairs to look after our dog? Mmmm. I'll still have to go downstairs to let the cat out, or I'll get no peace. Or maybe I should stay up later? But I hate working in artificial light. What a whiner I have become! I should just be happy I have a roof over my head, and food in my tummy. Mmmm, I wonder what's for dinner?